Brian, Jim, Ivan and Colin were all friends at Bodmin Grammer School. Sharing a mutual love of music they got together as The Vampires Skiffle Band. Once school finished Colin would leave for London to work in the civil service while the others remained in Cornwall. Colin would return to the county soon afterwards and the friends got back together again and starting playing music again. The formed The Druids Rock Unit and were heavily influenced by The Shadows. The Rock Unit would soon be dropped and the band known simply as The Druids. In the early days they were performing largely instrumental music, with about 80% of their set list being Shadows numbers. 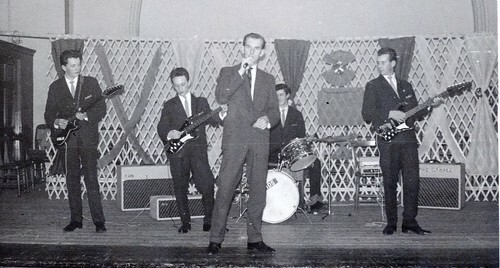 As the band developed they brought in Jim Amstrong to cover vocals, mostly Cliff Richard ballad numbers. Dave Thompson and Roger Bate would later come on board to sing the Rock & Roll numbers, Roger bringing his gold lame jacket with him! The band would rehearse in a basement room underneath Bodmin Public Rooms. With no tablature being available at the time they would all gather around a dansette with the latest records each listening and learning their own parts. 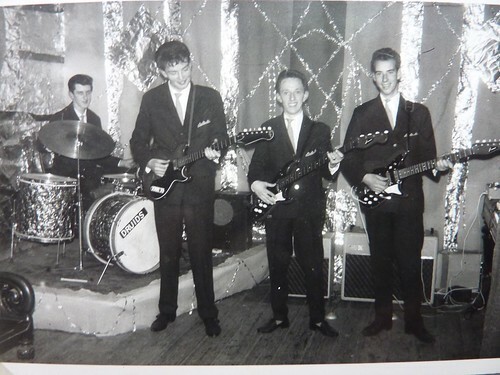 With the introduction of Dave and Roger the band started to bring in a few rock numbers, such as Elvis and Chuck Berry, although they still remained a predominantly ‘Shadows’ band. Not all vocalists would be available at each gig, so the line-up was quite fluid, the band would perform with however was free to perform on that night. The band was old school friends with Pete Brown. Pete would become a well known figure on the Cornish music scene through his BCD Entertainments agency, however his first real break into the industry was through managing The Druids. One of the first things the band did was to hire Egloshayle Village Hall and run their own dance. This extremely successful night lead to the band receiving bookings throughout Cornwall. 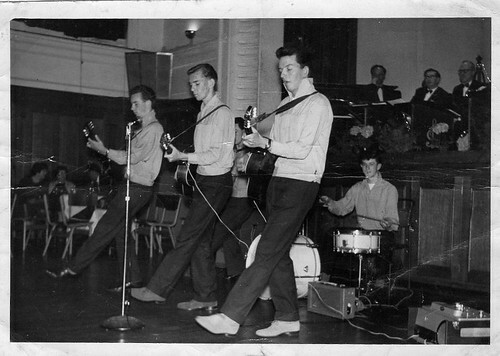 They would soon build up a reputation, alongside the Staggerlees and Jaguars as one of the most popular bands in the county. 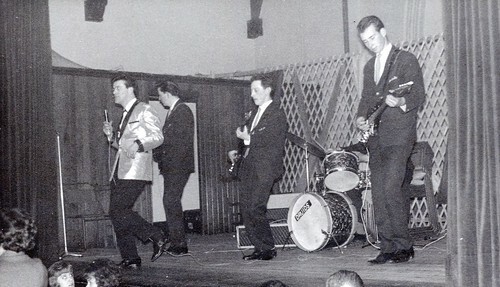 The band was the first rock and roll band to play in Wadebridge Town Hall, which was such a popular gig people were being turned away at the door. 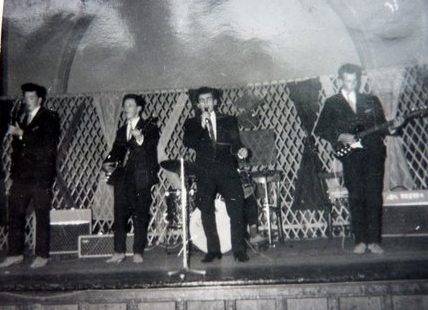 They were soon getting regular work, with Friday and Saturday night gigs at The Flamingo and Winter Gardens. They also had a regular monthly slot at the Skating Rink in Camborne, where after they had packed up after gigs they were allowed free reign to roller skate! 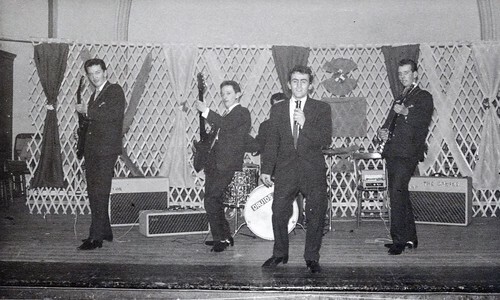 In 1962/63 they also had a regular Tuesday night gig providing the evening entertainment at The Edgecumbe Hotel in Newquay. 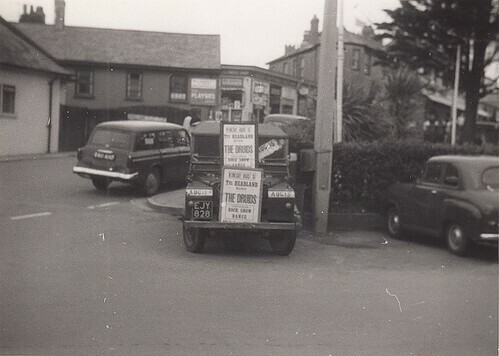 They also played a big event in Bodmin when Westward TV arrived in the town to launch the station, playing out of a railway carriage at the train station. The Druids competed in several Rock & Rhythm Contests. They won the very first contest in 1960, in the 1962 they came 2nd to The Staggerlees, but came back in 1963 to beat The Strollers into 2nd place winning an illuminated scroll on velum. 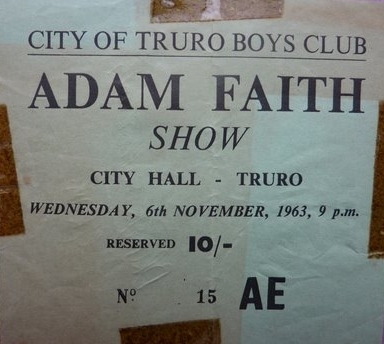 In 1964 they came back as special guests and performed a slot in the interval and in 1965 Adam Faith & the Roulettes played a special performance, with The Druids supporting. Rather embarrassingly as they opened their set (with The Shadows ‘The Savage’) Ivan tumbled off his drum stool! During his time with The Druids Brain Nichols was a police cadet, training to become a constable. 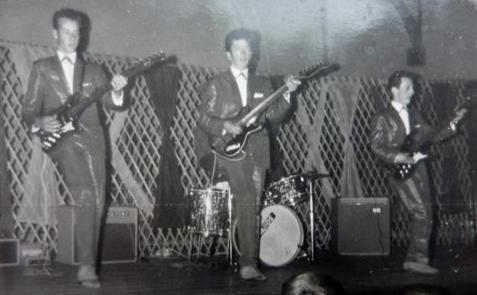 When he became qualified it was a requirement within the police force that constables should not take part in public roles such as performing in a rock and roll band, and Brain made the decision to leave the band. With the loss of Brian the band carried on for around 12 months, but with Brian gone they had lost their main Shadows influence. The band tried out other styles of music with several other members, but it didn’t relay gel and the finally called it a day. David Thompson has sadly since passed away. Vic Thomas is alive and well and working as a presenter at a local radio station in Scotland. 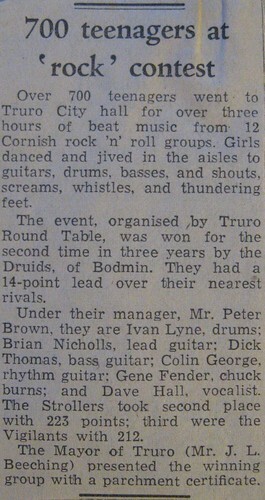 Vic Thomas, Ivan Lyne, Bryan Nicholls, Colin George and Jim Armstrong at the first Rock and Rhythm championships of Cornwall in 1960. Ivan and Bryan had been school friends at Bodmin Grammar since 1954 and began their musical careers in The Vampires Skiffle Group – Ivan on washboard and Bryan on tea-chest case. 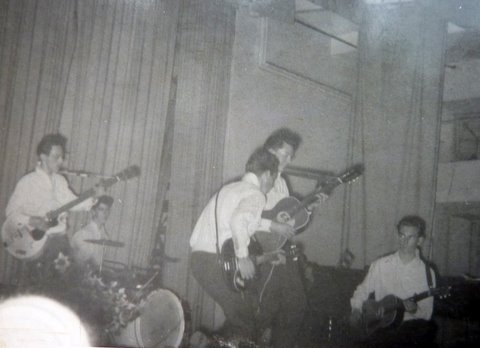 John Gosney and Richard Tatum were the other two members, both on guitars. Think Lonnie Donnegan and Cumberland Gap. 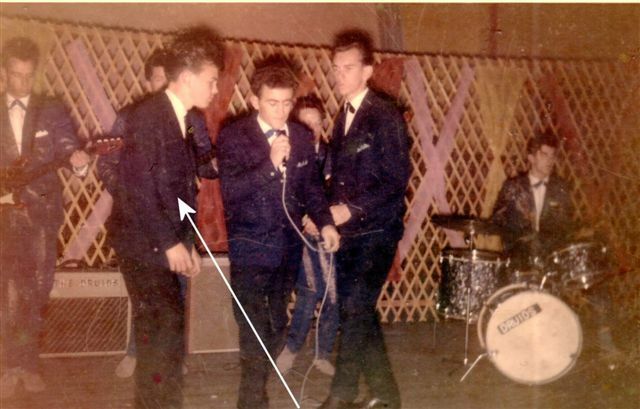 Bryan was later head-hunted by Frank Harvey and The Jesters to join them on guitar, and it's possible that Ivan also joined The Jesters on Drums at some point. The Jesters folded when Frank Harvey joined The Royal Navy, so Ivan and Bryan had to create The Druids. 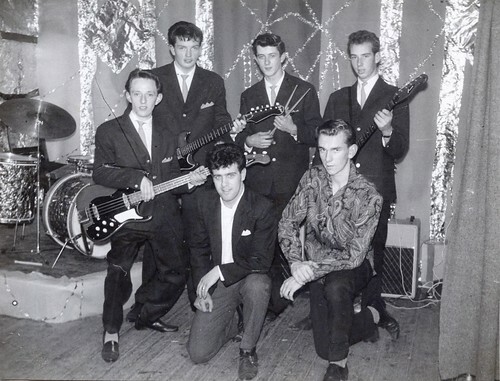 Joined initially by Jim Armstrong and Colin George, both on guitars, then by Vic Thomas because he not only had a base guitar but he had a van. 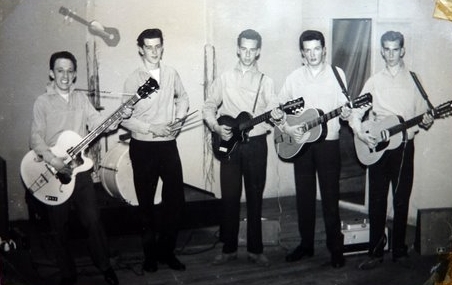 In 1960 Jim, Colin, Ivan and Bryan were all 17. Transport was a problem but we always seemed to manage to get where we needed to go, often by hiring a coach and selling seats to travelling fans. 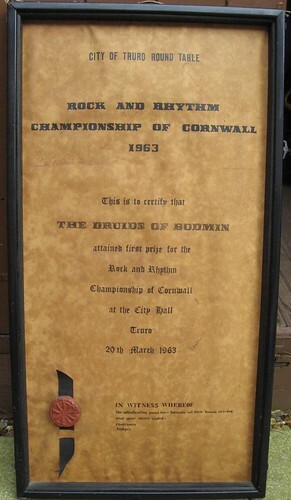 Another photo of The Druids at the very first Rock and Rhythm championship in Truro 1960. Having won the competition, people and organisations wanted to book The Druids. The money paid was invested in better equipment and covered the costs of getting to the venues. Some of the places included private birthday parties for teenage fans and all sorts of shows and dances. 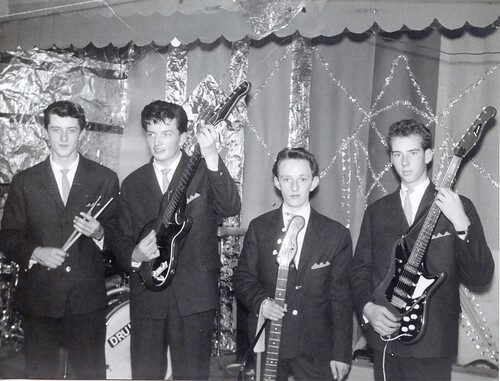 Vic, Ivan, Bryan, Colin and Jim 1960. Note the very primitive equipment. The Druids did receive a lot of encouragement from friends and family, and were asked to play at several school events. The fact that some of us were in the sixth form working on our A levels (as they were then) did limit the amount of time we could give to the band, but made us all the more determined to improve when we did get together. 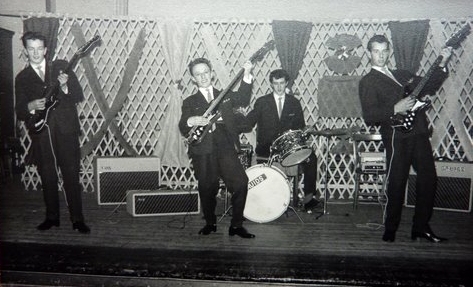 Vic, Colin and Bryan at the Bodmin Police Social Club Christmas Party, probably 1962. (Ivan and Jim are there somewhere). The Druids are now equipped with a full suite of Burns guitars, just like the Shadows at that time, and we all have our own Vox amplifiers. Lead guitar effects achieved using a Watkins copy-cat echo unit. Uniform now was light sand coloured suede shoes, black trousers, white shirts, deep blue jackets, powder blue ties, powder blue mock hankies. 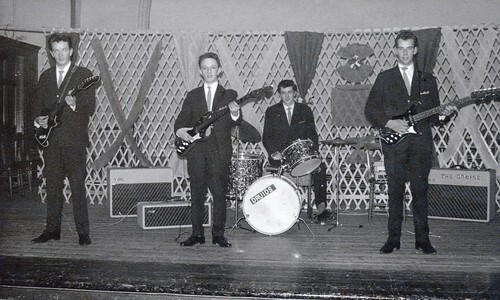 Jim Armstrong moved from guitar to be lead singer quite early on in The Druids history, with the stage name Gene Fender. Later Roger Bate (stage name Chuck Burns) and his famous gold lame jacket joined along with Dave (Nipper) Thompson (stage name Dave Hall). 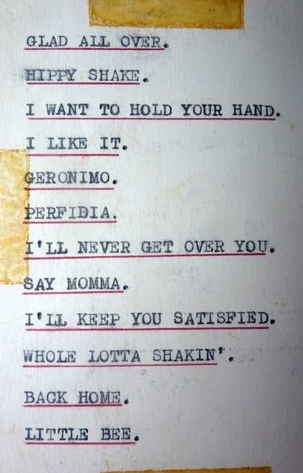 Usually singing as soloists, on occasion all three would belt it out together – 'Do You Wanna Dance' comes to mind. 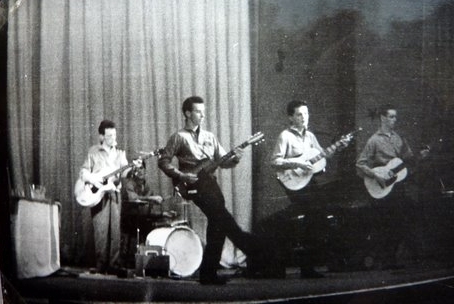 (Yep, Cliff Richard and The Shadows). One of the tickets bought by Druids friends and fans. Truro City Hall booked The Druids to be the supporting act for this prestigious show. The Druids used different places to practice on a week night, but mainly used a small room under Bodmin Public Rooms, possibly now part of the town museum. A young relative of Nipper started to come and listen to our practice, spending a lot of time watching Bryan play. During breaks when we would switch off the amps for a while to talk about things, this lad would politely ask if he could have a go on Bryan's guitar. After a few weeks we all began to realise that he was good, so we began to let him play with the amps turned on. He was very good. His name was Al Hodge, and we remember his Father Arthur Hodge (famous locally as the Bodmin Town Football Club Goalie) asking if he should encourage young Al and buy him a guitar of his own. We agreed and also suggested music lessons. Later Al would become one of the most accomplished lead guitarists ever with a career as a professional session guitarist – he's mentioned elsewhere in Kernow Beat. Playlist for a Druids gig somewhere, sometime. Colin, Vic, Dave (Nipper) Thompson, and Bryan at one of The Druids regular venues Bodmin Public Rooms. Other regular venues included Wadebridge Town Hall, The Highermead Country Club in Camelford, and during the summer season Mrs Piper's Dance Hall which was above her Cafe and Pasty Shop in Boscastle. Fondly remembered among other things for the half-time sprint to The Cobweb Inn for some liquid encouragement. The Druids also played more than once at the Camborne Roller Skating rink, very memorable for the past-midnight stop on the way home at Smokey Joes Cafe at Blackwater on the A30 for Gammon Steak, Egg and Chips. Possibly the only very late night Cafe in Cornwall, lots of other bands would stop here regularly on their way home from gigs. Still in business in 2010 I believe. Bodmin Public Rooms – The Druids striking a pose. IIn addition to regular bookings, The Druids would occasionally book a Town Hall or other venue and advertise both in the local paper and by having posters printed and going to the next venue two weeks before the date and putting up posters all over town. Launceston, and Callington were just a couple of places covered. By this time Peter Brown was the Druids Manager, and he would be the one taking the admission money on the door. David Kestell was also involved in moving The Druids to and from bookings (before they were called roadies). Both Peter and David were school friends of the band at Bodmin Grammar. Rare picture, unfortunately black and white, of The Druids in their second half outfits, acquired by Vic from somewhere in Plymouth. The suits were electric blue metallic with gold threads. Shadows walk time again. The Druids would later trade in the Burns guitars and upgrade to Fender guitars, with more powerful black Vox amps. 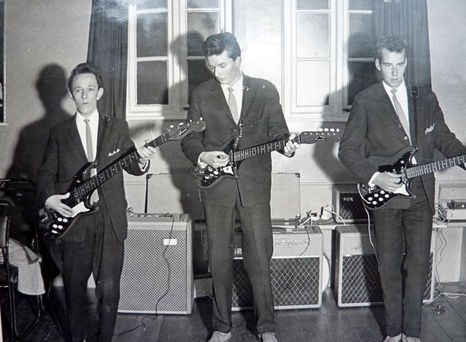 Bryan had a Coral coloured fender Stratocaster, played through an Echorette solid disc effects unit. Again, just like the Shadows. Personal addendum from Bryan Nicholls. Jim and I left school in July 1961. He joined Lloyds Bank and I joined Cornwall Police as a cadet. In September 1963 I became a Police Constable, which meant three months basic training at the area training college in a remote part of Dorset. Getting home at weekends was difficult and not often allowed. However I did manage to keep some dates with The Druids, looking a bit 'square' with my Police short back and sides haircut. I was posted to Camborne on completion of training in December 1963 and immediately rostered in a shift pattern of either 0600-1400, 1400-2200 or 2200-0600. Clearly I could only play if I was on an early shift. Cornwall Police never actually said I should not be a member of a group, but it was not encouraged. Ultimately my lack of availability lead to The Druids engaging another lead guitarist to enable them to honour their commitment to play regularly at John Bray's dance hall in Rock. I was not very happy about it all, especially as most of our instruments, including my Stratocaster and Black Vox amp, were being bought on hire purchase. This meant I had to give it all back and walk away with nothing. My Police career, after two years in Camborne, took me to Launceston, where I trained as a Traffic Officer driving patrol cars, and later to Bude. In July 1969 I resigned from the Police, and in November 1969 I moved to West London and began a career in civil aviation with BEA, later to become British Airways. I retired from BA in July 2003 when I was 60, and have worked for my local community in Surrey since then. For my 65th Birthday, my family bought me a coral coloured Fender Stratocaster and an effects amplifier. Vic, Colin, Ivan and Bryan with (kneeling left) Chuck Burns and kneeling right) Gene Fender. Photo taken at Callington. Gene in action - Bodmin Public Rooms. Dave in action - Bodmin Public Rooms. Ivan would also play with The Jaguars, Geoff Richards Band, Robert Salmon Trio, Hairy Magpie, Lake Harmony, Trevenson Tree Tramplers and Mr Rusty's Raz-A-Ma-Taz Revival Machine. He now plays, along with Colin George, with Rickety Bones, alongside other members of various 60s bands.